What exactly is in a name? That’s the question many visitors to Yosemite National Park were asking when news came down that officials would be changing the name of the park’s most popular hotel and collection of cabins. 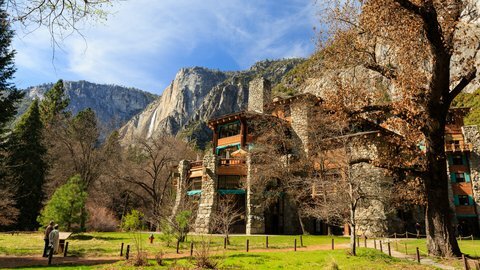 The Ahwahnee Hotel, a name that’s been connected to countless trail guides, will be renamed the Majestic Yosemite Hotel, according to a press release. A collection of cabins near the center of the park that’s been known as Curry Village since the 1800s will now be called Half Dome Village. The changes come not because the park wanted to or because it was forced to. It changed the names to avoid a possible $50 million judgment. It all comes down to a company called Delaware North, which last year lost its $2 billion contract to operate the hotels and restaurants within the park. Turns out when the company got the job back in 1993 it was required to pay $115 million (in today’s dollars) to purchases the assets of the previous concessionaire, including its intellectual property, a spokeswoman for the company told the LA Times. That intellectual property included the names of the hotel and cabins, so the company offered to sell the rights back for $50 million. But park officials, instead of waiting for the court claim to be resolved, went ahead and changed the names anyway. The decision and the situation in general had many visitors livid. In its latest contract with the new concessionaires, Aramark, officials made clear that this time around, those names are staying put. “While it is unfortunate that we must take this action, changing the names of these facilities will help us provide seamless service to the American public during the transition to the new concessioner. Yosemite National Park belongs to the American people,” stated Superintendent Don Neubacher in a press release.